Recently, I was privileged to be invited to be a guest speaker at Meet the World, a unique series of events hosted by the Minato Ward office in Odaiba. 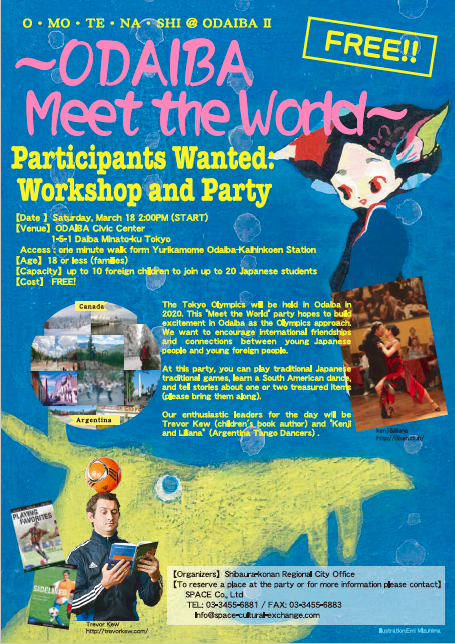 Inspired by the upcoming 2020 Tokyo Olympics, Meet the World offers young children the chance to learn about different cultures in the hope of forging stronger connections between Japan and the rest of the world. The focus this year was on North and South America, and I have to say that the South American representatives were a lot more dynamic than I was. They were salsa dancers! After a stunning demonstration of their dance-floor skills, they got everyone up (almost everyone…I managed to escape to the nearest wall) learning some basic steps and then putting it all together. My focus, writing, was not quite so culture-specific, but I tried to help the children think about telling a story for someone from another country. How can you invite someone into your world when it is somewhere they have never visited? Using some of my own stories (set in Canada) as a foundation, I asked the students to choose a single treasured object from their lives around which to build a story. I was not sure how well they would take to this, but it turned out to be a hit. I look forward to reading their many successful novels in the future! Doing the entire hour-long session in Japanese was pretty tough. I don’t think I’ve felt that nervous in front of a group in my entire life. To anyone who gives a presentation or teaches a class in a second language, I now know how you feel. It is one of the most daunting tasks that you can throw at someone. My sincere thanks to the organisers and participants of Meet the World! I hope the rest of the sessions are just as successful.